"The Powder & the Glory"
They were in the cosmetic industry, but they were more than that. They were giants of industry. They created an industry. It just so happened it was in the world of powder and paint. Elizabeth Arden (left) and Helena Rubinstein were competitors for more than fifty years. 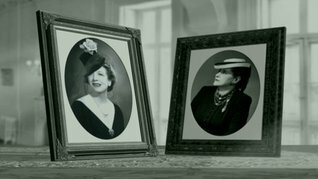 "The Powder & the Glory," a 90-minute documentary narrated by Jane Alexander, tells the story of two of the first highly successful women entrepreneurs — Elizabeth Arden and Helena Rubinstein. One hundred years ago these women immigrated to America and, starting with next to nothing, created what is today the $150 billion global health and beauty industry. Operating in major cities all over the world, their competing companies defined the business of beauty, making cosmetics both newly respectable and, finally, indispensable. They developed advertising and marketing techniques that became part of the business landscape, and they themselves became household names and cultural icons. When they started their businesses, makeup was used mostly by prostitutes and performers, and businesses were run mostly by men. They changed the way we look at ourselves, built powerful businesses, and became two of the world's wealthiest women. Elizabeth Arden was born Florence Nightingale Graham and raised in poverty on a farm in rural Ontario. She came to New York in 1907, and began work as a clerk in a beauty shop. By 1910 she had reinvented herself as Elizabeth Arden and opened her own salon. In 1912 she joined a women's suffrage march on Fifth Avenue, and later announced, "every woman has a right to be beautiful." Through the makeup wizardry of David Nicholas, model Courtney Craft appears in the facial styles of each decade from 1910 through the 1960s. Helena Rubinstein was born Chaya Rubinstein in Krakow, Poland. As a young woman, she fled to Australia where, in 1906, she opened a shop and began selling pots of face cream. In 1914, having already opened salons in London and Paris, she arrived in New York and began a lifelong competition with Elizabeth Arden. Although they lived and worked only blocks apart in New York for over 50 years, the two women, by design, never met! Their competition drove them both to great creativity and success. Whenever one launched a successful product, the other sought to outdo her rival with a bigger success, and as soon as possible. Rubinstein said of her rival, "With her packaging and my product, we could have ruled the world." They both influenced, and were influenced by, the major movements of the day in art and style. When the "close-up" became a staple of motion pictures, makeup became au courant. Women flocked to Madame Rubinstein and Miss Arden. Their salons were showcases of modernist design, and Madame Rubinstein was a leading collector of avant-garde and African art. Miss Arden collected racehorses and opened the first resort health spa in the United States. They helped usher in the "new woman" of the 1920s — young, independent, and in every way equal to men. Throughout their careers they supported women's empowerment and rights. Coming as I did from a conservative European background, my attitude as an individualist — a girl who preferred to make it on her own rather than stay at home — was all the more unusual. "The Powder & the Glory" was produced, written and directed by Ann Carol Grossman and Arnie Reisman. The film is a production of Powderglory Productions, LLC in association with The Center for Independent Documentary, YLE Teema Ateljee, AVRO, and ABC Australia, and is presented by South Carolina ETV. The Powder & the Glory is based upon the book "War Paint: Miss Elizabeth Arden" and "Madame Helena Rubinstein — Their Lives, Their Times, Their Rivalry" by Lindy Woodhead. The author had unprecedented access to correspondence and diaries that enriched her book, and access to her book and research has enriched the film. On-camera interviews include Kitty Carlisle Hart (actress, singer, television personality); Twiggy Lawson (actress and model); former Arden creative directors Pablo Manzoni (makeup) and Stephen Glass (hair styling); Shirley Lord (journalist, author, businesswoman); Lindy Woodhead (author of the definitive joint biography, War Paint); Harvard Business School professors Nancy Koehn (Brand New) and Rosabeth Moss Kanter (Confidence); Kathy Peiss (Hope in a Jar); Virginia Drachman (Enterprising Women); Marie Clifford (Helena Rubinstein's Beauty Salons, Fashion, and Modernist Display); Suzanne Slesin (Over the Top: Helena Rubinstein: Extraordinary Style, Beauty, Art, Fashion and Design); and more. For more information and resources, please visit the film's website. The Open Mind: Naomi Wolf Interview about "Beauty"
To The Contrary: New Face of MAC Makeup Iris Apfel is 90 Years Old!